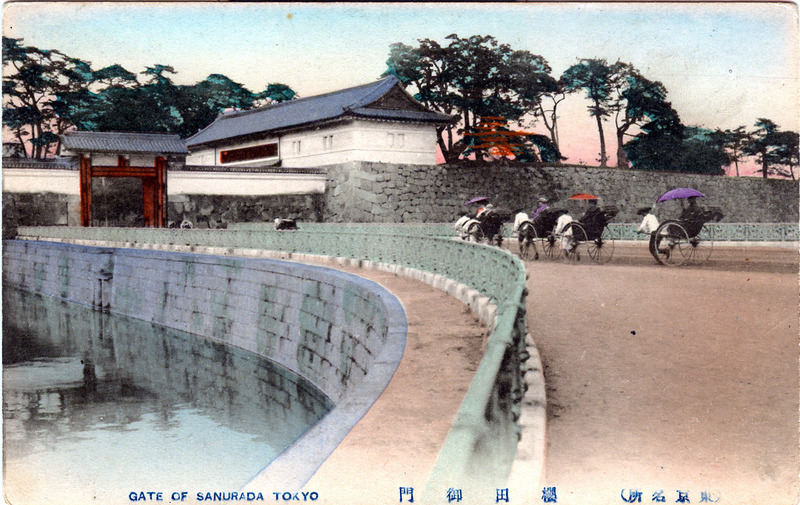 HRM’s royal carriage on the palace plaza in front of the Seimon gate and Nijubashi, c. 1910. In the distance, at right, is the Fushimi tower. “The original castle, which was long known as Yedo Castle (Edo-jo), was erected late in the 15th century by Ota Dokwan from whose descendents it was later wrested by the Hojo, afterwards to pass into the hands of Tokugawa Ieyasu. It comprised a main, middle, and outer castle, surrounded by miles of moats and stone walls, which in turn were pierced by 25 gates supplemented drawbridges. The gates, the towers, and all the fortifications were of such massive proportions as to constitute one of the most stupendous works ever undertaken,n ot excepting even the pyramids of Egypt. 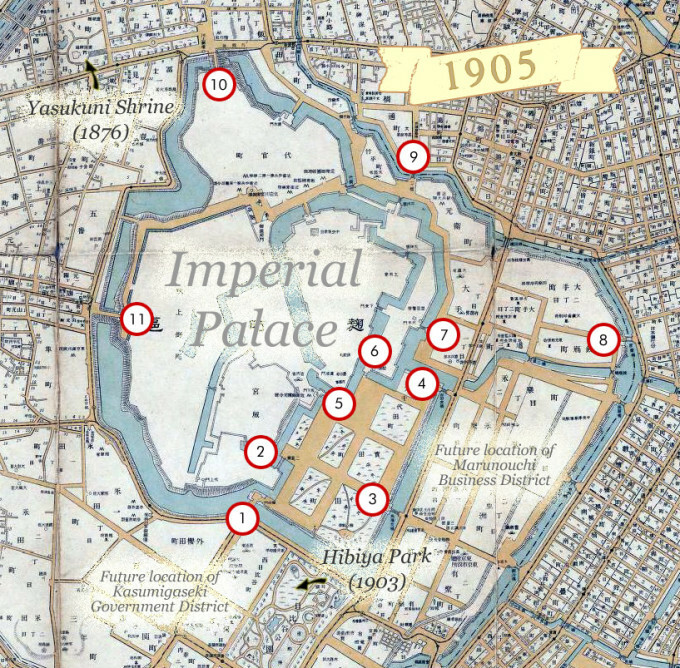 “The Imperial Palace (gosho) stands on an elevated site which was once the geographical center of the capital, and from which all distances were computed. 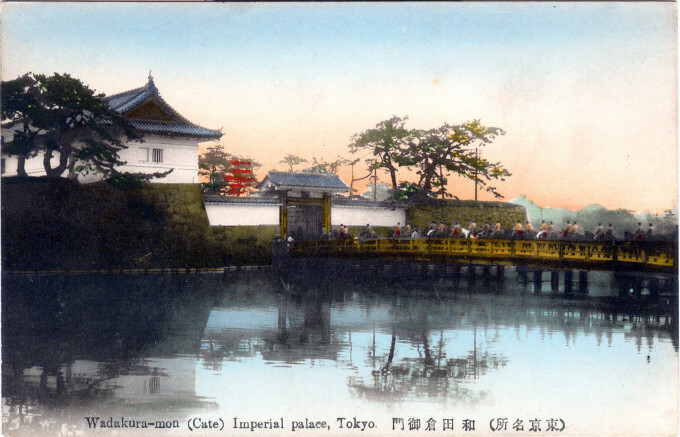 As the political and intellectual center of the Empire, the Japanese regard it with unusual reverence; the public is rigorously excluded, and only those are granted the Imperial favor are admitted within its sacred precincts. 1. 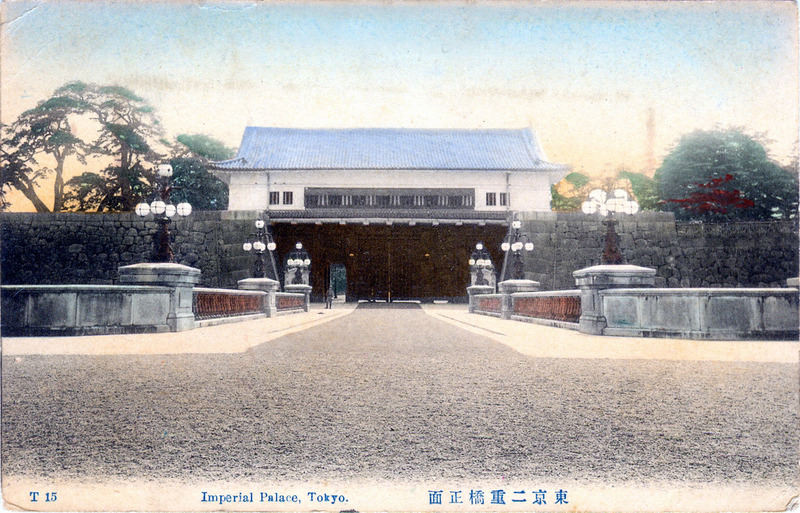 Sakurada-mon: The ceremonial entrance to the palace grounds; 2. Sei-mon: The main entrance to Edo Castle; 3. 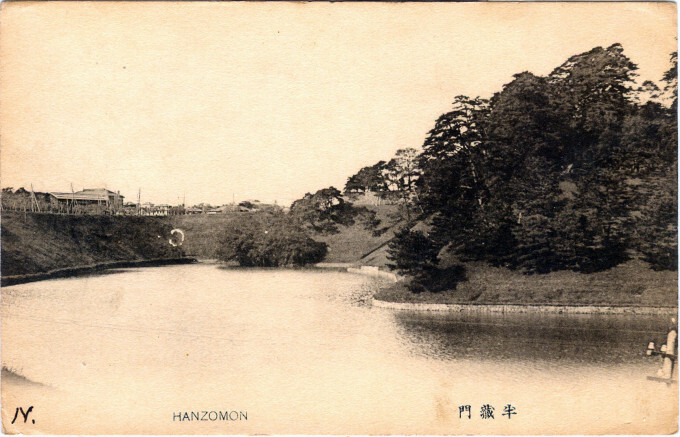 Babasaki-mon: Razed in 1905; 4. Wadakura-mon: Razed in 1905; 5. Sakashita-mon: The present-day entrance to the Imperial Household and palace; 6. Kikyo-mon: Also known as the Inner Sakurada gate, through which minor officials and tradesmen accessed the castle. 7. Ote-mon: Provided access to the inner castle from the daimyo district. 8. Tokiwabashi: Connected the mint to the castle and palace grounds; 9. 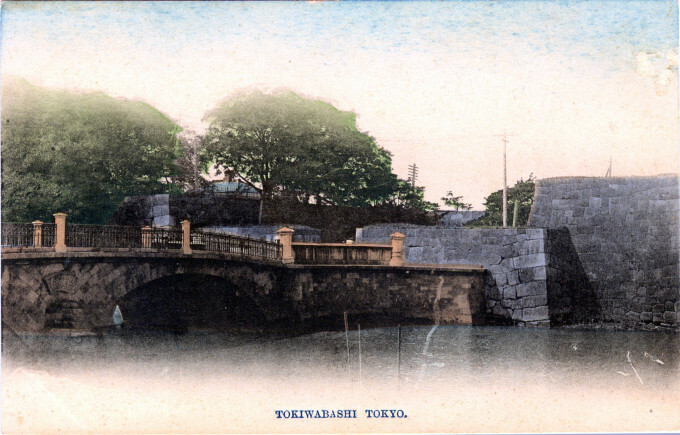 Nakabori-mon: Gate through which the Shogun’s retainers entered the castle grounds. 10. 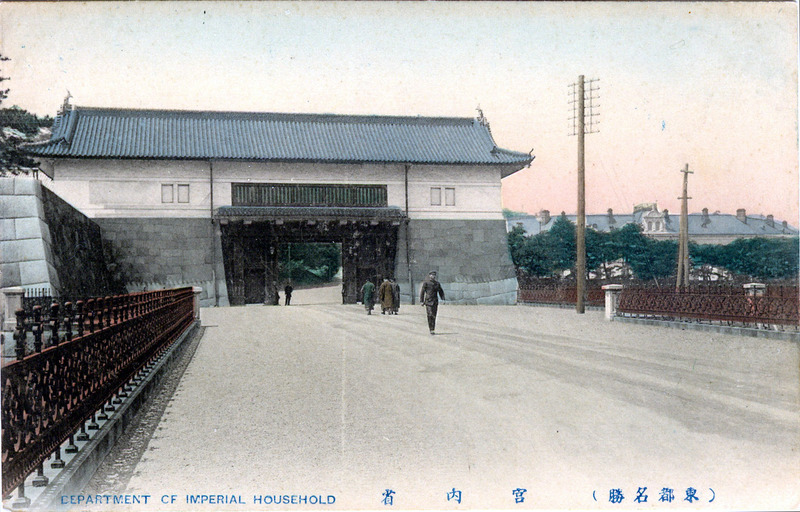 Tayasu-mon: North gate, and access to Yasukuni Shrine. 11. 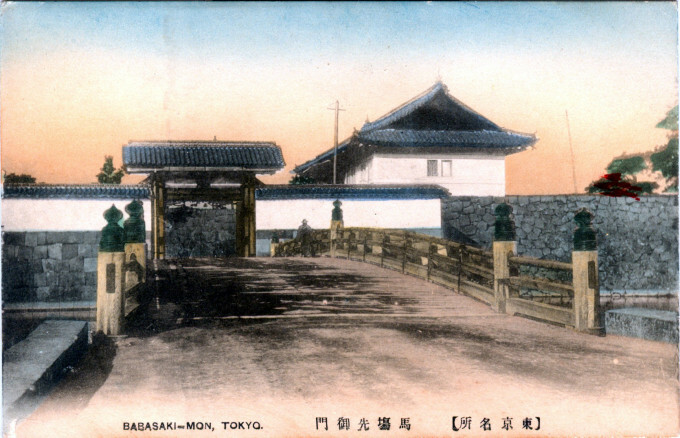 Hanzo-mon: West gate entrance from Akasaka and the Akasaka Detached Palace. 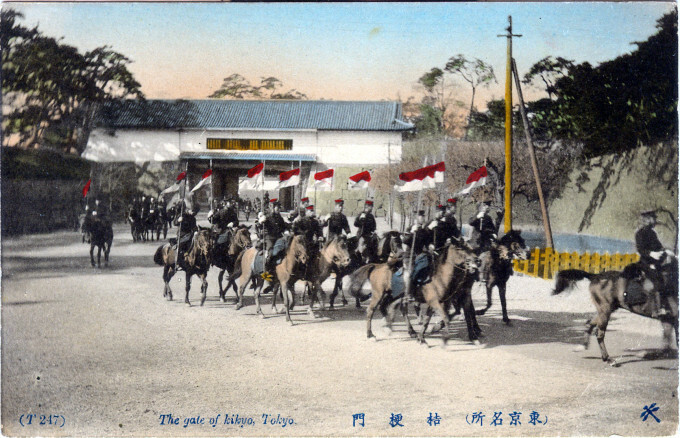 “In 1869, after the last of the Shoguns had surrendered his trust to the Emperor, the Court moved from Kyoto to Tokyo and occupied the palace of the Shogun. “Of the several Gates (most of which date from the big fire of 1657) the best known to the casual traveler is the Seimon Gate at the SE corner of the inclosure; a massive iron structure (opened only on special occasions), with a postern, a penthouse and a guard. The twin bridges (Nijubashi) when seen from a certain angle look like a single bridge with two passageways. “Visitors usually enter the through the Sakashitamon farther along toward the north. 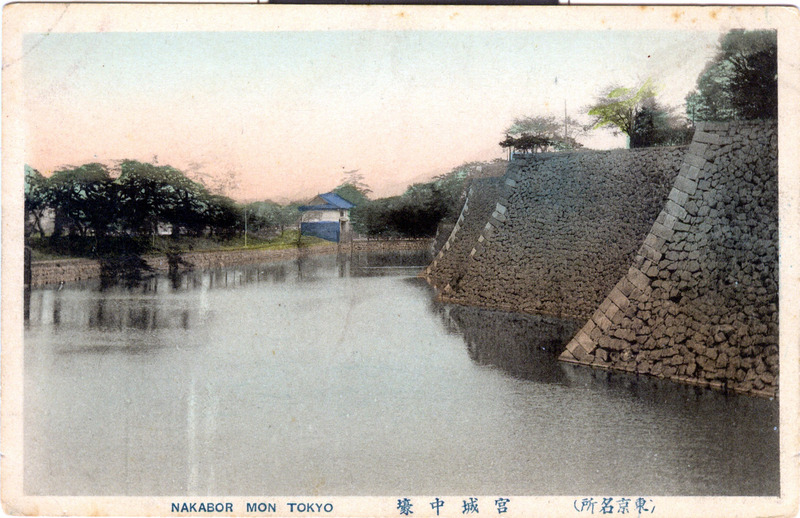 The Babasakimon which prior to the Japan War spanned the outer moat about 1-mile to the east of Seimon was razed because it was too small to admit of a throng at one time; its demolition was hastened by a fatal crush which occurred during a demonstration at the close of the war in 1905. 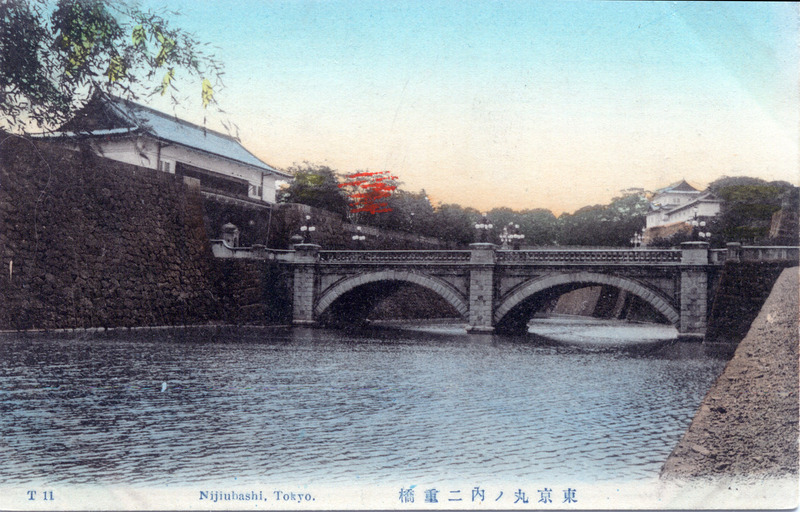 “Coincidently the road leading the Seimon was widened, as was also the broad Gaisendoro (Road of Triumph) which flanks the Palace moat on the east and commemorates the Japanese victory over Russia. Sei-mon & Meganebashi, c. 1910, with Fushimi tower in the distance. 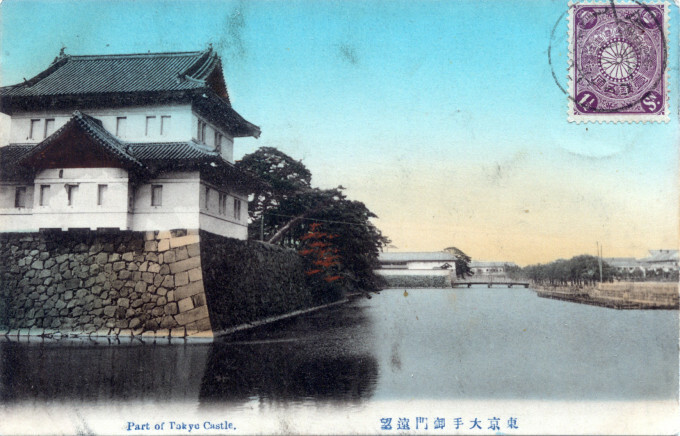 Tasumi tower (foreground) & Ote-mon, c. 1910. 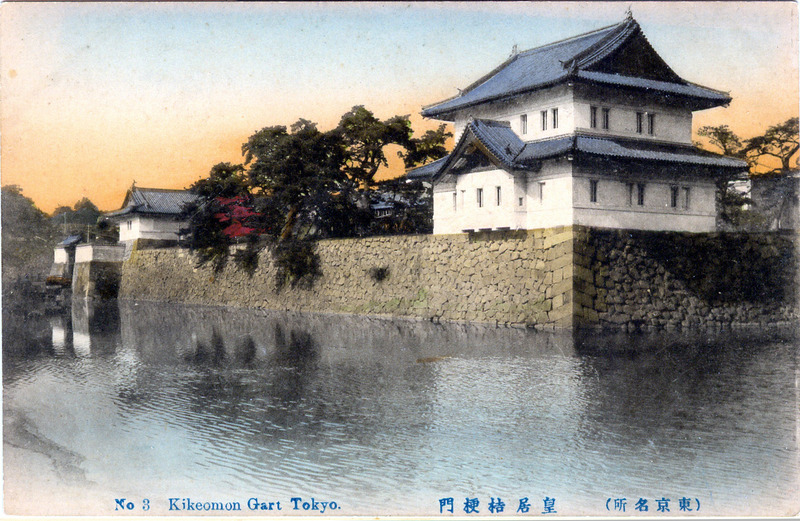 Tasumi tower (foreground) & Kikyo-mon, c. 1910. Tokiwabashi-mon, near Nihonbashi, c. 1910.